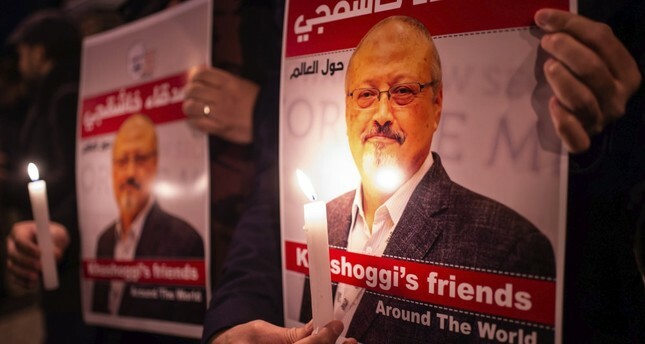 People hold posters of Saudi journalist Jamal Khashoggi and light candles during a gathering outside the Saudi Consulate in Istanbul, Oct. 25. It's been almost three months since Jamal Khashoggi entered into the Saudi Consulate in Istanbul only to never come out again. Despite being committed at the heart of one of the biggest metropolises in the world and inside a diplomatic mission on top of that, the murder of this U.S.-based Saudi journalist had quickly gained a reputation for being one of the most brutal and mysterious crimes in recent history. Although this hideous incident initially dropped like a bombshell with hundreds of questions, most of these unanswered mysteries have gradually been uncovered. A recent book on the issue, however, sheds even more light on the crime, revealing new details that help us get a clearer picture of the events that lead to the dissident journalist's murder and what transpired afterward. "Diplomatic Atrocity: The dark secrets of the Khashoggi murder," a book that is released today and written by Ferhat Ünlü, Abdurrahman Şimşek and Nazif Karaman, from Turkey's Sabah newspaper and published by Turkuvaz Books, presents itself as a reliable source for those who are interested in the issue, while revealing brand new details. Some of the most striking new details are the revelation of the identities of two new people who were members of the so-called "hit squad" and new audio recordings that give information about both before and after the murder, proving that the crime was premeditated and committed cold-bloodedly. Until now, all we knew was the fact that the squad consisted of 15 members whose identities have already been uncovered and three others that helped, as mentioned by President Recep Tayyip Erdoğan. Although the identity of one member of this "plus three" was already revealed by the Sabah as Ahmed Abdullah A. el-Muzeyni, who is known to be the Istanbul chief of Saudi intelligence, the other two individuals' identities kept their mystery until now. The first name to be revealed is Saad Muid el-Karni, a security guard at the consulate who is actually a member of the Saudi intelligence. The other member of the squad was also working as a security guard at the consulate while he was actually a member of the intelligence service and his name was Müflis Şaya M. el-Muslih. Just like el-Muzeyni, these two people were also using a diplomatic passport. However, they were not included in the 7.5-minute-long voice recording of the last moments of Khashoggi that was shared with several countries and intelligence agencies. Khashoggi, a columnist for The Washington Post and a critic of Saudi Crown Prince Mohammed bin Salman, also known as MBS, was reported missing by his fiance Hatice Cengiz after entering the Saudi consulate in Istanbul to obtain marriage documents on Oct. 2. In November, the audio recording of the moments Khashoggi was killed was reportedly given to Saudi Arabia, the U.S., France, Canada, Germany and the U.K. Gina Haspel, director of the U.S. Central Intelligence Agency (CIA), also listened to the "compelling" audio tape of the brutal killing in late October in Ankara. The reason behind their absence from the recording was the fact that they were not leading the execution team but the exploration team, which was responsible for getting rid of the body and thus explored various places in Istanbul, arriving in the city a day before the hit squad. The 7.5-minute-long voice recording, on the other hand, mostly revolved around the talk of Maher Abdulaziz M. Mutreb, the leader of the execution squad, and Salah Muhammed A Tubaigy, the toxicologist who was responsible for handling Khashoggi's dead body by cutting it into pieces. After weeks of shifting official narratives, Saudi Arabia said the journalist was killed by a "rogue operation" and arrested 18 people allegedly connected to his death. On the same day of Khashoggi's disappearance, 15 other Saudis, many of them Saudi intelligence operatives, arrived in Istanbul and visited the consulate at the same time of the disappearance. All of the identified individuals have since left Turkey and were later arrested by Saudi authorities, including Mutrib and Tubaigy. The book mentions a secret source who spoke to the writers of the book under the premise of anonymity. This source states that although Tubaigy was reported to be detained, he is actually living at a villa in Jeddah with his family. The source said that Saudi officials told Tubaigy not to be "in the limelight," implying that not only Tubaigy but also others who were supposed to be detained are not actually under arrest but instead pursue a secluded life. Turkish officials have repeatedly suggested the murder trial be held in Turkey where the crime was committed. Saudi authorities have denied Turkey's requests and said the suspects will be tried in the kingdom. Another thing that is revealed in the book is the fact that the voice recordings are not made up of that 7.5-minute-long piece. As a matter of fact, the recordings are much more comprehensive and long. For instance, a recording from an hour before Khasshoggi was killed includes the speeches of Mutreb, el-Tubaigy and el-Harbi. These recordings show that the three murderers say that they will first tell Khashoggi that he will be taken to Riyadh and if he refuses, he will be killed. According to the book, these recordings were actually the ones that convinced Haspel the murder was planned and not a result of a sudden decision. The recordings also show that before the murder Tubaigy says he is good at "cutting." "I've never worked on a warm body so far but I can easily handle him [Khashoggi]. Normally, when I'm cutting cadavers, I would put my headphones on and listen to music. I'd also drink my coffee at the same time," Tubaigy says in the records. Previously, media sources reported that Tubaigy was listening to music while cutting Khashoggi's body. However, the recordings show that although he normally listens to music, there is no evidence of him listening to music in this case. When Khashoggi was told, as promised by the murderers before, that he will be brought to Riyadh, he refuses. Then, Mutreb says that if he cooperates, he will be forgiven. He then asks Khashoggi to send a message to his son Salah, who is in Riyadh, to ensure him that he is in Istanbul and safe as not to raise suspicions. "If you can't reach me for a while, don't worry." The killers wanted Khashoggi to write to his son via text message, but he refused to do that as well. Khashoggi is then heard asking in the recordings: "Are you going to kill me? Are you going to strangle me?" The book states that when he finally understood that he will not come out alive from the building Khashoggi still remained cool and stood still. Then, with the order of Mutreb, five members of the hit squad attacked Khashoggi to strangle him by covering his head with a nylon bag. According to the recordings, the last sentence of Khashoggi was, "Do not cover my mouth, I have asthma. You are going to have to strangle me." Reportedly, Khashoggi resisted his killers for five minutes.. According to the book, the recordings of these five minutes are so dramatic that even the intelligence members, who have experience on such issues and thus have astuteness, had quite a bit of discomfort while listening. Even Haspel was reportedly emotional while listening to the recordings and the voice of the translator who translated from Arabic to English trilled and trembled. After listening to the recordings, Haspel tells Turkey's National Intelligence Organization (MIT)'s chief Hakan Fidan that this is a success that can be achieved "once or twice in the history of intelligence," and congratulates him. The incident takes place at the office of the kingdom's Istanbul Consul General Mohammad al-Otaibi, and contrary to media claims he did not say anything like "don't do this in my room".. Another claim that was all over the media but is actually false is Mutreb's call to someone from the consulate saying "tell the boss the deed is done." According to the book, there is no evidence on that matter. The New York Times reported in November that Mutreb called a superior and told him to "tell your boss," with media reports suggesting it was MBS, to confirm that the "mission was carried out" and "the deed is done." The claim of a local collaborator first mentioned by the Saudis is another one debunked in the book, which states that it was an attempt of the kingdom to "manipulate" the case. Riyadh had previously mentioned the existence of a local collaborator in the case. Yet, when Turkey asked Riyadh to identify them, that same claim by a local collaborator was denied by Saudi Prosecutor Saud Al-Mojeb during his visit to Istanbul on Oct.30. Meanwhile, the book also enlightens readers on questions about the recordings, since there were many claims in the media regarding the issue, implying that they were unlawfully achieved and Turkey was deliberately listening to the building. In reality, the recordings were automatically saved, meaning that Turkey did not deliberately listen to the consulate and save the records. There are also the recordings of the phone traffic between Istanbul and Riyadh, starting from Sept.28, the day that Khashoggi first entered the consulate to demand papers regarding his marriage. The records show that the murder started to be planned on that day. The process of dismembering Khashoggi's body after his killing lasts for half an hour, according to the recordings and the operation was done with an autopsy saw. During the process, the book states that the personnel present in the scene feel bad and nauseated, while Tubaigy shouts at them asking "Why are you standing like that?" According to the book, there is also no evidence on how the Saudis got rid of Khashoggi's body, including any findings on dissolving the body through acid. Following the incident, the consulate was cleared from the residuals of the crime in three stages. Firstly, the murderers themselves roughly cleaned the consulate. Then, the consulate personnel did some thorough cleaning in the afternoon the same day. Lastly, the 'real' and most detailed cleaning takes place after nine days passed from the murder with the arrival of two experts on the issue: a chemist, Halid Yahya el-Zehrani and a toxicologist, Ahmet Abdülaziz el-Cenubi. These two people, known in intelligence terms as "wipers," came with an 11-member Saudi group that visited Turkey following the incident with the claim of helping to uncover the murder. This last cleaning lasted for a week, until Turkish intelligence teams examined the consulate on Oct.17. The book also seeks answers for the reasons why Khashoggi was murdered. Khashoggi is known as a dissident figure that was highly critical of MBS, the kingdom's crown prince. However, according to Ömer Abdulaziz, a close friend of Khashoggi and an activist based in Canada who gave an exclusive interview to the writers of the book, the journalist was more than a critique of the Saudi government. He was actually working on a joint project named the "army of the bees" with Abdulaziz. This social media army was supposed to consist of Saudi dissidents aiming to show the realities of the kingdom against the trolls of MBS, who are also known as the "flies of MBS", quite active on social media and do whatever it takes to glorify Saudi Arabia. Khashoggi was even personally invested in the project by giving $5,000 to Abdulaziz, promising he will find more from other Saudi dissidents. Knowing the works of Khashoggi, the Saudi government started seeing the journalist as a threat, Abdulaziz claimed. Revealing his text messages with Khashoggi, Abdulaziz showed that Khashoggi said MBS was like a "pac-man." Khashoggi's murder prompted an unprecedented international outcry and forced many countries to reassess their ties with Riyadh. Although Saudi officials have denied numerous times that the royal family and MBS had no prior knowledge of the murder, all evidence has been pointing at the crown prince as the mastermind. Today, with the revelation of these new details on the matter, the international community has almost all the information about the Khashoggi case. However, one question remains unanswered: Where is Khashoggi's body?